(CNSNews.com) - President Donald Trump was up very late watching election returns in five states, and as expected, he tweeted his approval of the results, including the special election in Ohio, where the Republican leads but the Democrat has not conceded. The race is said to be too close to call. According to the New York Times, Republican Troy Balderson leads in Ohio's 12th congressional district by 0.9 percentage points, or 1,754 votes, over Democrat Danny O’Connor with 100 percent of precincts fully reporting. Balderson and O'Connor are vying to replace a retiring U.S. congressman, and they face a re-match in November. Appearing on CNN's "New Day," Democrat Party Chairman Tom Perez noted that the Republican who ran in Ohio's 12th congressional district just two years ago won by more than 30 points: "And here we are in a dead heat today, and a rematch in 90 days and health care will be squarely on the ballot," Perez said. -- "Congratulations to Josh Hawley on your big Senate Primary win in Missouri. I look forward to working with you toward a big win in November. We need you in Washington!" -- "Congratulations to Bill Schuette. 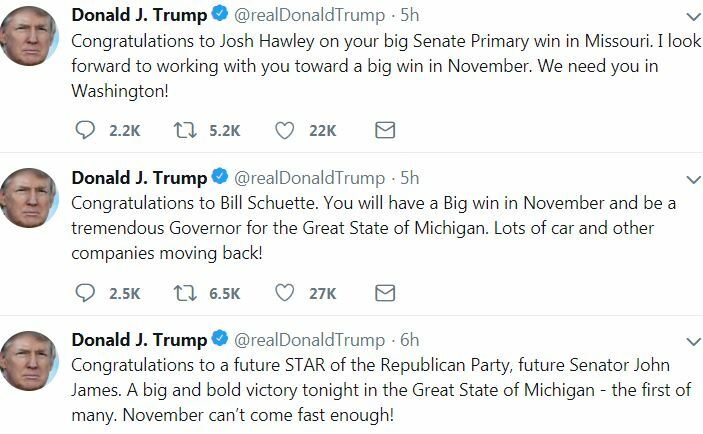 You will have a Big win in November and be a tremendous Governor for the Great State of Michigan. Lots of car and other companies moving back!" -- "Congratulations to a future STAR of the Republican Party, future Senator John James. A big and bold victory tonight in the Great State of Michigan - the first of many. November can’t come fast enough!" -- "Congratulations to Troy Balderson on a great win in Ohio. A very special and important race!" -- "When I decided to go to Ohio for Troy Balderson, he was down in early voting 64 to 36. That was not good. After my speech on Saturday night, there was a big turn for the better. Now Troy wins a great victory during a very tough time of the year for voting. He will win BIG in Nov."
In Missouri, Republican Josh Hawley is trying to unseat incumbent Sen. Claire McCaskill, who easily won the Democrat primary. Adding in all the other candidates in both races, 663,553 people voted on the Republican side in Missouri yesterday, and 605,503 voted for Democrat candidates. In the Michigan governor's race, Bill Schuette will face Democrat Gretchen Whitmer. Both easily won their respective primaries, and in this case, far more Democrats cast ballots (1,073,359) than Republicans (943,002). In Michigan's U.S. Senate primary, John James won the Republican primary with 54.8 percent of the vote; incumbent Sen. Debbie Stabenow, the Democrat whom James hopes to unseat, was uncontested. President Trump also endorsed Republican Kris Kobach for Kansas governor, but as of this morning, that primary race was too close to call, with only a few hundred votes separating Kobach from his closest Republican competitor. DNC Chairman Perez told CNN on Wednesday he sees "incredible energy" on the ground among Democrats. "But more broadly, there's 60 seats for the House -- 60 seats or so that are more competitive than this race (in Ohio) yesterday, And so, as I look at this race, and again, we don't know who's going to win yet, but you know, close to a dead heat, and I look at the landscape, not only in that district but across America -- people want candidates who are going to be fighting for health care; people want candidates who are going to protect Social Security and Medicare; people want candidates who are trying to bring people together. “And so this gives me optimism, not only about this seat but about other House seats, the U.S. Senate and governor's races."